To bring a strict liability dog bite case, a plaintiff must show 1.) that their injuries were the result of a dog bite and 2.) that they were in a place they were legally entitled to be. Courts have held that injuries stemming from an animal placing its teeth on a person may count as a bite, even if the teeth do not break the skin. However, an owner would not likely be subject to strict liability for injuries sustained while a person was running from their dog. Under California’s dog bite statute, a person is lawfully on the private property of another when they are performing an official duty (such as a police officer or postal worker) or when they are on the property with the owner’s express or implied permission. As noted above, strict liability only applies in situations where the victim is bitten by a dog. Importantly, California law allows for those who have been injured (but not bitten) by a dog to pursue a claim under the theory of negligence. To successfully bring a negligence case against a dog owner, a plaintiff must establish the four elements of a negligence claim: duty, breach, causation, and damages. The elements of duty and damages do not typically present a difficulty for dog bite victims. However, in California dog bite cases brought under the theory of negligence, whether the defendant breached a duty owed to the plaintiff and whether that breach was the cause of the plaintiff’s injuries are frequently contested. Have You Been the Victim of a California Dog Bite? 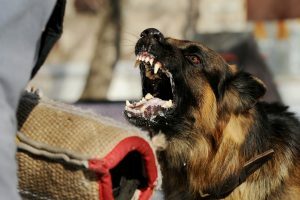 If you or someone you love has recently been attacked by a vicious dog, contact the dedicated California dog bite lawyers at the Neumann Law Group. At the Neumann Law group, we represent injury victims across Southern California in all types of personal injury matters, including California dog bite cases. We have over 200 years of collective experience that we put behind each of our client’s cases. To learn more, and to schedule your free consultation, call 213-277-0001 today. Court Determines California University Is Not Responsible for Injury at Fraternity Party, California Injury Lawyer Blog, February 25, 2019. Court Holds Minority Tolling Is Not Available for California Claims Under the FTCA, California Injury Lawyer Blog, March 11, 2019.